It’s that time of year again! We are now booking a limited number of weekend spots available for Full Portrait Sessions, with your chosen date & location. We are also offering a $50 discount for weekday sessions. Custom Portrait Sessions are available anywhere in the SF Bay Area. E-mail us now to reserve your session date. 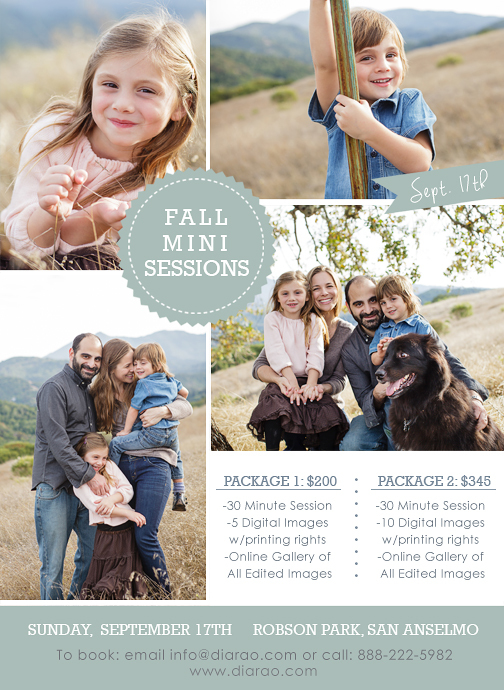 We also have one Mini Session Date Available this year, Sunday, September 17th in San Anselmo. E-mail info@diarao.com to book your time spot.